1920's, 40 bust, black silk crepe, with reverse side of silk satin. 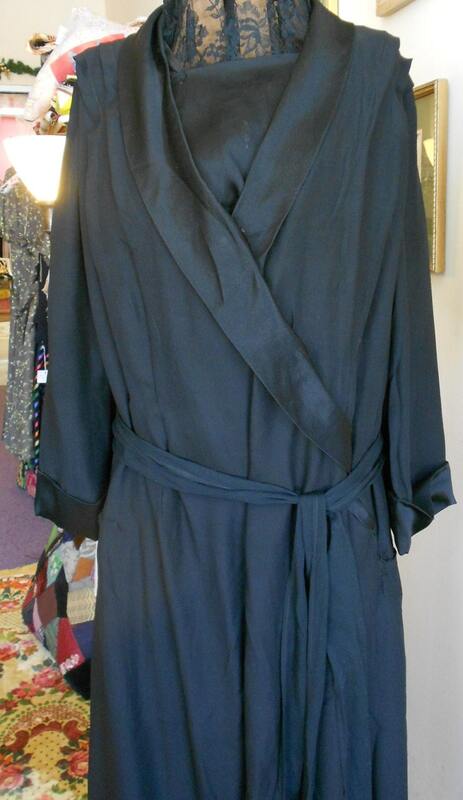 1920's, 40" bust, black silk crepe, with reverse side of silk satin. 1920's, 40" bust, black silk crepe, with reverse side of silk satin. Dress has long sleeves and open V neckline. Long bodice under V neckline, interior of dress, independently fastens bodice in front with hooks and eyes. Lapels cascade from behind neck to upper hip, and is fastened at waist and hip with snaps. Dress is loose with straight lines from shoulder to hem. A long black silk sash with silk tassels at each end comes with dress and can be tied at waist, hip or neck. width at bottom of skirt 64"